We are very excited to participate in the 4th Annual Cottage Charm Giveaway hosted by Twice Remembered Cottage! After you enter our giveaway below be sure to go over there and enter to win the many other giveaways! For this event we are giving away our new Lovely Little Bird Nest Necklace! Featuring a lovely little sterling silver bird nest with 3 eggs, two glass flower beads and pulled together on a sterling silver box chain. Visit our shop here then come back and tell is in the comments box, which item you like best. This must be done before extra entries count. - Sign up for our newsletter. Last day to enter is May 29th. Winner will be randomly selected and announced here on the blog. Winner will have 72 hrs to contact us to claim their prize. GOOD LUCK! Well besides the necklace you are giving away.....I love the "I am" necklace. I would customize it to say "I am Mommy" So cute!! I have always loved the Simply Ornate Monogram Ring! Your button is on our blog under Favorites! is my favorite! Hard to pick from such a great selection! Hope you'll drop by my blog for my giveaway too! I'm By the Hill, number 22 on the Cottage Charm Giveaway list. Well, I love the little pearl hoop earrings, but my favorite of all is the Lovely Little Bird Nest Necklace. so- i really hope I win it! It is so sweet!! I just subscribed to and look forward to receiving your newsletters! I like this one-Sterling Silver Initial Necklace with Freshwater Pearl. I Love the lovely little birds nest or the "he loves me" necklace-so sweet!! Love, love love the simple ornate monogrammed ring! It is beautiful! i love the custom oval tiny charm hand stamped necklace. Hello! I'm so happy I found your blog. Love your creations. I browsed the shop and it's hard to choose, but one of my faves is the Key to My Heart necklace! So fabulous. My absolute favorite is the lovely little bird nest necklace that you are offering. It stole my heart. Hello! I'm a brand new happy follower of your fabulous blog. Thank you for another chance to win your sweet, sweet necklace! Hello - I am a new subscriber to your newsfeed via my email! Can't wait for updates! Love love the bird nest!! I also love the "With God" necklace! Such a wonderful verse to have hanging around! Hello - I just Tweeted about your sweet giveaway! I really love the My Heart is on the Line necklace! I havent seen anything like that...really cute! I love all of this jewelry and I would love to win the Heart Stamped Necklace for my daughter Emily. Thanks for such a great giveaway! I love the Custom Oval Tiny Charm Hand Stamped necklace. What a sweet way to wear your child(ren)s name to show that you're a proud Mama! Love the sweet bird nest on the prize necklace. It make be a great gift for my Mother-In-Law because she has 3 children! everything is soooo pretty, but if I have to pick favs...the 'i am blessed" and of course "cupcakes make me happy" thanks so much for the chance. I love this giveaway! I do love the #CAP149 To Be Mommy (or Grandma) necklace. The one in the giveaway is beautiful as well! I don't know if that's how you link to a twitter post, so just in case, you can also visit my timeline at twitter.com/steebswife. I love the beaded Circle Monogram Pendant, but I also love the I am Blessed necklace. I love all your stuff but what can I say I really love Lovely Little Bird Nest Necklace it's to cute. I'm a new follower and look forward to getting to know you. I love the Monogram Sterling Silver Square Ring. I just love the Simply Ornate Monogram ring, but also love all the rings!!!! You have so many lovely items. I also love the sweet birdnest necklace. Thanks for your generosity. Pick me! Iam into all things monogramed! I am now a follower, so pick me twice! If you get a chance take a look at my Cottage Charm giveaway! Thanks for the giveaway, I love the Simply Ornate Monogram Ring! That's easy: With God All Things Are Possible, and the birdnest one you're giving away! I really like the Simply Ornate Monogram Ring! My favorite is the Simply Ornate Monogram ring. I love the Faith, Hope and Love 1 Corinthians 1313 Ring. I love the necklace you are giving away but also the monogram ring and tiny initial! Love the Christian themes! You got yourself some talent girl! Thanks for the chance to win one of your fabulous creations! Oh I truly adore the "He Loves" necklace. How beautiful that you share you talent and love for Christ all in one. I hope you'll stop by and enter my giveaway as well. Love the monogram ring, but really there are so many great items. BTW, love your site. I love the little necklace. So precious! I was more than happy to sign up for your newsletter! You have wonderful items. The Real Love Waits purity necklace in your shop is my favorite! So very true. I would love the Singing Sweet Songs Hand Stamped Necklace. But the bird nest necklace would be the best. Because we are adding to our nest. And the room colors are the blue and green too! And I am a subscriber as well! I tweeted about Cap Creations (I'm TarnishedRose on Twitter). I posted about Cap Creations on Facebook. Marilyn Hughes. Your shop has beautiful such items. Custom Oval Tiny Charm Hand Stamped Necklace. I like the hanging pearl earrings and the pearl bracelet. AND...the necklace you are giving away! i love the best friends necklace!! I also adore your "Darling Heart Hand Stamped Necklace!" I posted Cap Creations on Facebook. Oh my goodness... I love the Monogramed Sterling Square Ring! Fun giveaway! My favorite is the birds egg necklace you are giving away! My other favorite is the Oval Monogram Bangle Bracelet. How pretty! I saw lots of pretty pieces that would make great gifts. I love the Hand Stamped Washer Keychain. What a great way to keep a reminder of your loved ones close to through out your busy day. Pick my the 29th is my birthday! Ouuuu your creations are amazing! Love the birds nest you are giving away! Its precious, I also love the dangling heart and the cupcake necklaces! You are so talented! I love the Key To My Heart Necklace! Linked you in my blog post today! I am a follower of this new-to-me blog. So glad I found you! This is such a great giveaway. I checked out your amazing store and I love all of the stamped necklaces, but my favorite is the cross that says He Lives. "Cupcakes make me smile"...I love it!!! I am your new follower #342! I love your Carried Bracelet! i LOVE the Simply Ornate Monogram Ring. i'm sad the ring has been discontinued and you only have size 5 and 9 left. i may get one anyway and hope it fits!!! i just subscribed to your newsletter, too! posted a comment on my fb page. i believe this is the link you need.... or at least i hope it is! I love the hoop and pearl earrings. They are very elegant yet would go with casual or dressy outfits. Please enter me. I really love bird's nests and the necklace is wonderful. I have just become a follower. I will be back often to visit. This is my first visit to your blog and I love it!! Your jewelry is very sweet. I really like the faith, hope and love ring. Also the 'chosen' necklace is really special - especially since we've adopted. I love it!! This birds nest necklace rocks! It's one of those 'wear everyday' pieces. Thanks for the chance to win! I love and only wear white gold or sterling silver, so I love most of what's in your shop! I adore the necklace you're giving away, and everything in your shop that includes a tiny freshwater pearl (my favorite) - especially the cupcake charm plus pearl one. I also adore the square monogram ring. Thank you for the chance to win! I love the Custom Oval Tiny Charm Hand Stamped Necklace! SO pretty! everything is so lovely. Thanks for the chance to win! I like the Key To My Heart necklace! I signed up for our newsletter. what a wonderful blog! i love the necklace featured. it is so pretty. i also love the necklace that says with God all things are possible. so true :) thank you for having a giveaway ! What a wonderful blog you have! I'm so glad to have found you! Beautiful giveaway necklace ~ perfect for me as our last name is BIRD, and there are only 3 in our little family!! I am now your newest follower, too! 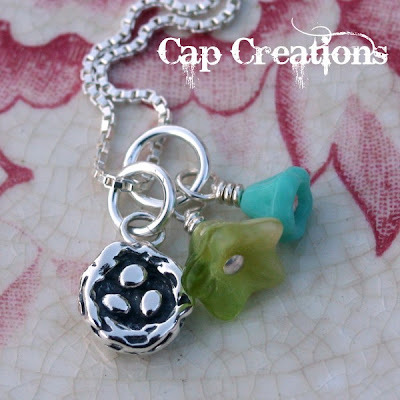 I'd be honored if you would stop by my blog and enter my Cottage Charm giveaway, too! I also just signed up for your newsletter. I am really loving your real love waits necklace for my granddaughter!! I've now added your pretty giveaway button and a link back to you to my blog, too! I'm a new follower as well. Thanks. I love the Custom Oval Tiny Charm Hand Stamped Necklace & I'd do 2 charms for both my girls. I have to say though, I think that adoption necklace is my favorite. It is just so sweet! Ah ha! "Skateboarding is not a crime"! I've signed for your newsletter, too. I liked the I am blessed necklace...so true! God is so good! great pieces! my favorite is "i am blessed" necklace. Thanks for the chance to win this lovely necklace! One of my favorites is the Lovely little bird necklace and also the He loves me. Loving the Beaded Circle Monogram Pendant. And it is so popular it is out of stock! This is a nicely crafted necklace! You have a lot of talent! I would like to enter the contest. I will subscribe. I like the music playing on the website. I adore the Name It Hand Stamped Necklace. I just love the pearl accent, I'm a sucker for pearls! Thanks for the chance to win the bird's nest necklace. I like the Name it Hand Stamped Necklace - and the Bird Nest necklace. Such a nice giveaway.